Suitable for mild steel, stainless steel, aluminium and most common metals. 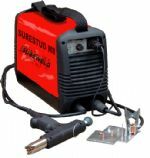 Welds M3 – M8 studs, pins, nails, tags etc. One sided operation with no reverse side marking. Kit of fasteners, various size collets and slide hammer for dent pulling available as an optional extra.